This is my first time to your site and I have to say that seeing THIS picture side by side with the "finger" picture shows a world of difference! 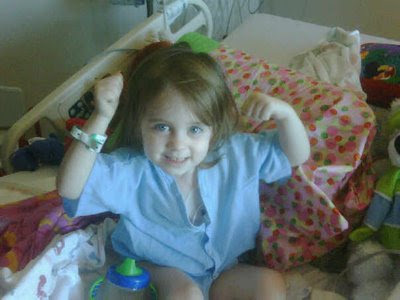 She's adorable and you can tell that she's a fighter! What a difference in pictures! It's so great to see her beautiful smile. At the same time, though, you can sure tell that in the finger picture, this nasty cancer is going to lose its battle!!! What a kid!!! !